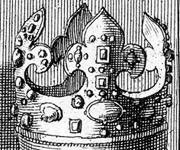 Crown of St. Louis. It is made of gold and decorated with very many precious stones, among which is a ruby which is worth a great price. In this ruby is enclosed a spine from the Crown of Thorns of Our Lord. Félibien, pages 541. Translated by Jane Vadnal. Crown taken to the Mint in 1793 and melted down in April, 1794. In 1987, H. Schubnel identified the emerald affixed over the central "ruby" as the same one now found in the Paris Museum of Natural History. However, this identification remains hypothetical-many scholars say there is not enough evidence to confirm it. Louvre, no. 48, pp. 239-41.